My September 2008 trip to the low countries included visits to 16th century canal houses, many art museums, a chocolate museum, a brewery and the lace museum in Bruges, Belgium. 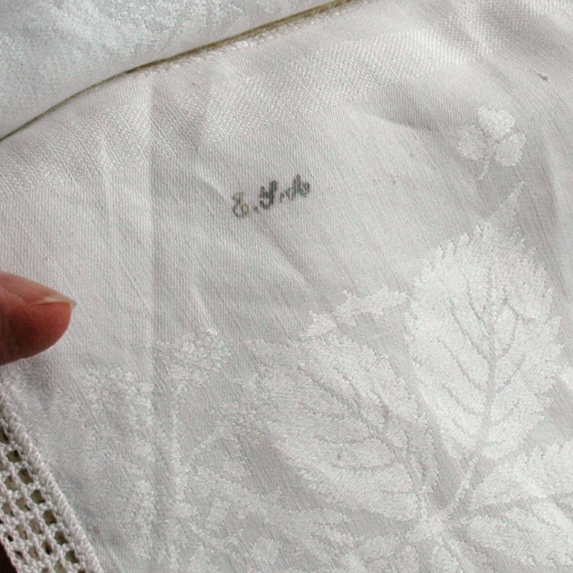 here are some musings on the state of handmade linens and lace in the world today. In one museum, I saw a filet lace panel that was dated 1599. Bobbin lace was invented in this gorgeous region. You can hardly walk half a block in the old city center without passing at least one linen and lace shop. Unfortunately, most shops sell the same kinds of things and most of the things have been imported from China. (really) Some are pretty, (but mundane,) pieces. But they have nothing to do with the superb tradition of handmade linens and laces. Several years ago in Venice, I did a double-take when I saw on display a very expensive Point de Venise tablecloth that looked to me as though it had been made in China. When I went into the shop to get a closer look, the Chinese shopkeepers confirmed my suspicions. There is nothing wrong with selling or buying Chinese-made lace but selling Point de Venise in Venice implied that it had been made in Venice. Most people who visit lace shops in Bruges would assume that everything had been made in Bruges. Some shops displayed older pieces in their windows or inside. 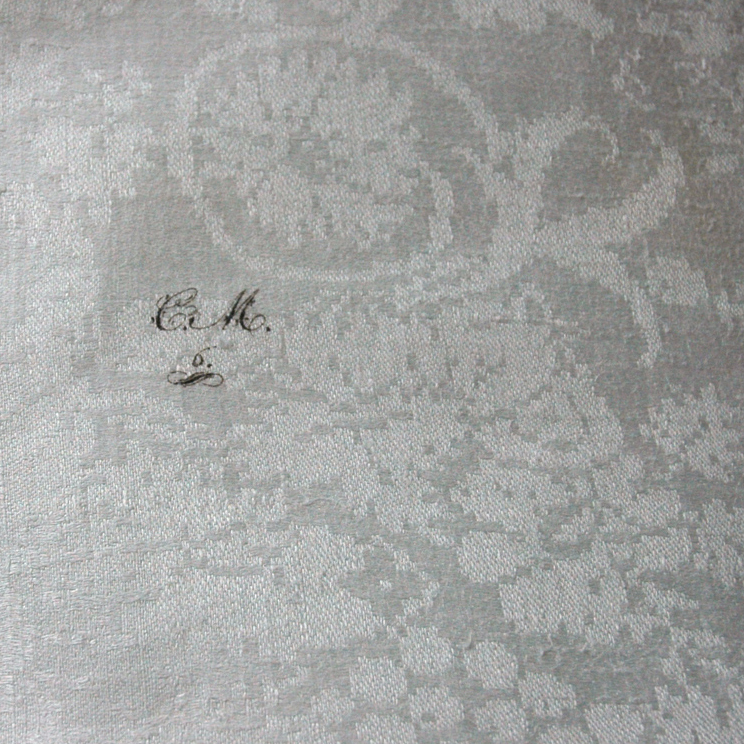 (at prices that were expensive, even with the very weak dollar) The vintage Duchesse lace handkerchief in the next photo costs over $200. This hanky costs approx. $450 USD. 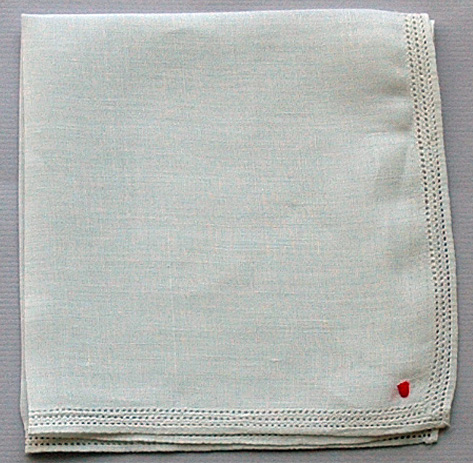 This lovely Rose Point (or Point de Gaze) Hanky is nearly one thousand dollars. This “rosaline perleé” bobbin lace-edged embroidered round tablecloth is over $2,000. The lace shop “Irma” sells only items that have been handmade in Belgium, both modern as well as antique. The shop sells lovely bobbin lace items that are made by area lacemakers. 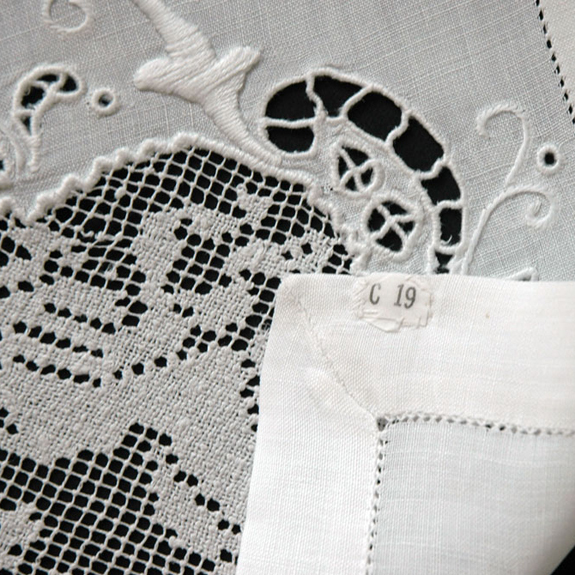 The shop also has some amazing antique laces including a 16th century handkerchief with a pricetag of Euros 5,000. (about $7,500.) 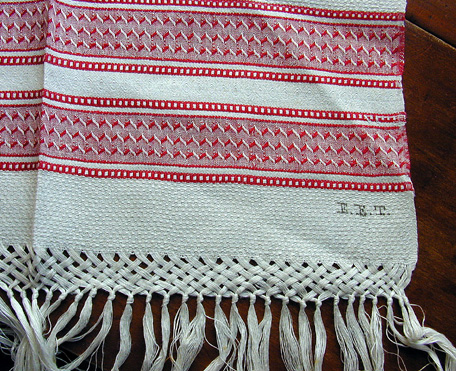 The owner of the shop guessed that it had taken six or seven years to make that handkerchief. Lacemaking today is a cottage industry that is a labor of love. The shop owner estimated that, when all is said and done, that the lacemakers earn about an euro an hour for their painstaking work. He also told me that, because there are no young lacemakers working today, within 10-20 years there will be none left at all. If you have an opportunity to travel to Brugge, please do so. I know you will enjoy it. I found the following (random) items to be interesting. Although there were plenty more that were on display in places that did not permit photography. The maroon velvet banner on display in a cathedral is embroidered with gold and silver metallic threads. This photo shows a statue garbed with ornate fabrics, embroidery, brocade, gold and lace. Forgive my blurry photos but I hope they give you a taste of how richly decorated and beautiful she is. I loved seeing the altarcloth in the next photo in use. It caught my eye because it was completely worn through with holes. 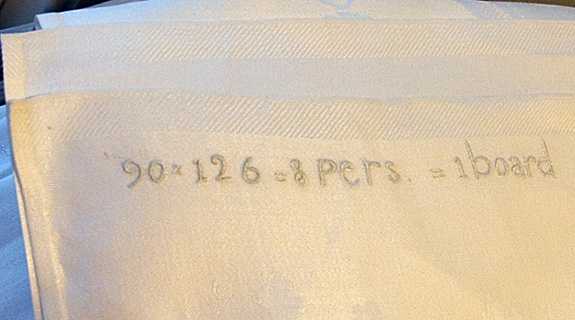 The dilemma of keeping track of ones linens has posed a problem throughout the centuries. In days when people owned very few possessions and linens were necessary and precious goods, household inventories listed them. They also needed to be tracked and identified when they were sent away to be laundered. From the times when they were sent to Holland to be washed and bleached upon the grasslands and in later times (after the New World was discovered) when they were sent to soak up the Caribbean sun, people still needed and wanted to have their own things returned to them. Even if they were being given to a local laundress who collected them from the doorstep and then returned them, each household needed to differentiate their things so that the correct items would be returned to them. Markings needed to be immediately understood, (relatively) easily made and as permanent as possible. Many systems have been in use. 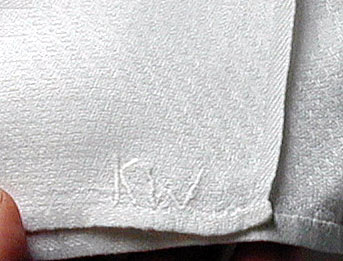 Monograms (woven and embroidered) were used to mark the linens and signify ownership. 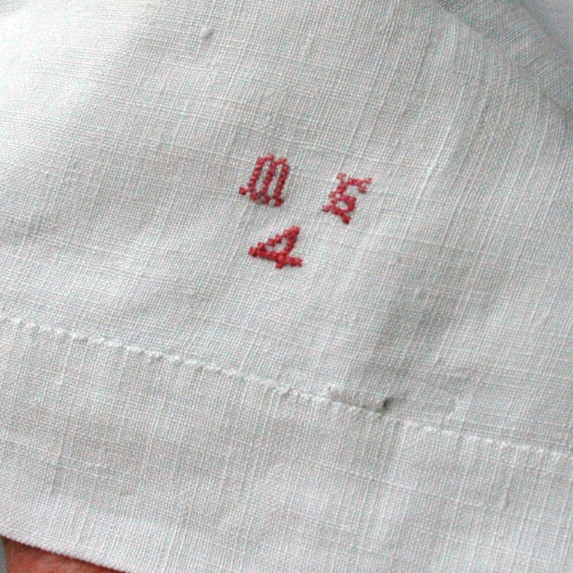 Names, initials, ciphers and numbers were also embroidered onto linens, often at the top or bottom edges. 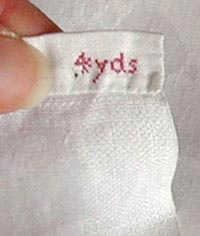 Sometimes, initials were used in conjunction with the number of the piece. (tablecloth #1, sheet #65, etc.) Indelible inks were concocted and were written upon the items. 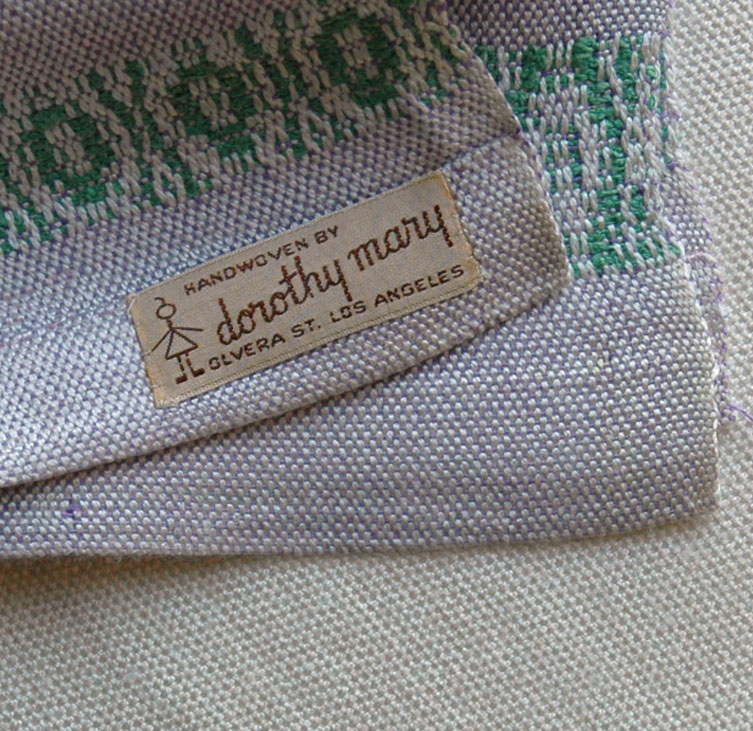 Later cloth tags or labels were sewn onto items and were sometimes stapled with huge unsightly pieces of metal. It seems that these markers were so essential that, how they looked was not nearly as important as how they functioned. To our eyes, some methods seem time consuming or odd, others seem clunky or downright ugly. 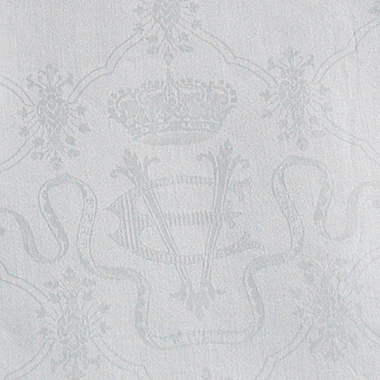 Monogram and royal crest woven into damask fabric. The crest is of Vittorio Emanuele III, King of Italy. Of course, the pattern was also decorative. Some of these napkins were also stamped in black to further differentiate them. 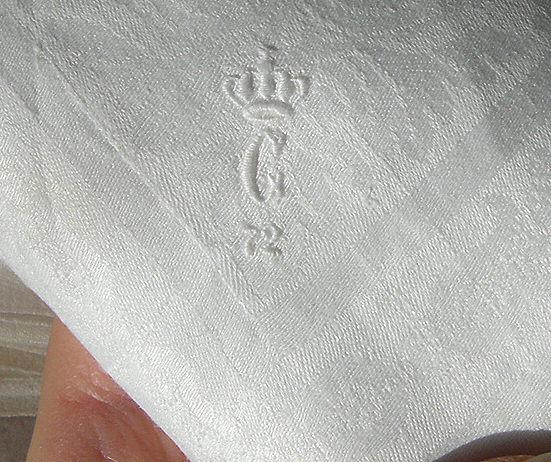 Monogram and royal crest embroidered into damask fabric. 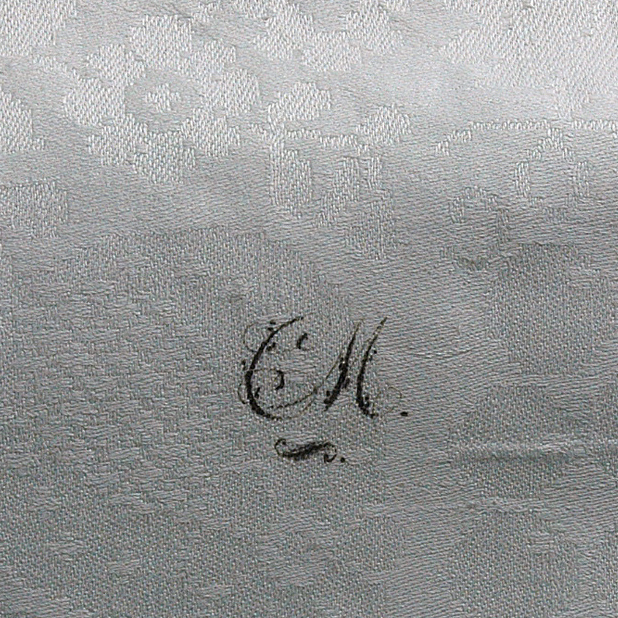 This monogram is from a tablecloth belonging to a member of the Germanic Princely House of Saxe-Meiningen. 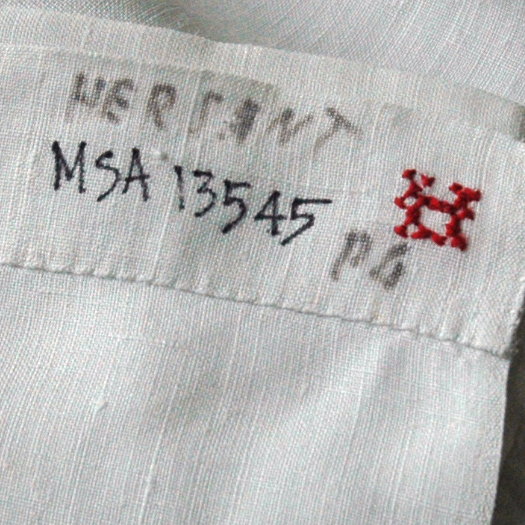 This is an example of beautifully embroidered laundry/inventory marks. Other items were embroidered by less skilled hands. 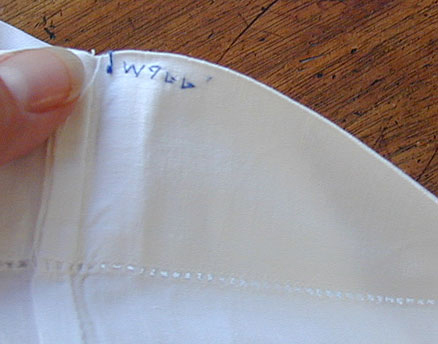 Another useful marking variation is to indicate the size of an item, usually for tablecloths, occasionally for bedding. I received some lovely old whitework centerpieces…more than likely Madeira. When I washed them the embroidery turned blue. I know that many pieces have the blue embroidery, but this is the first time that I have washed whitework and the embroidery turned blue! The blue is lovely, but I purchased them for the white on white which is my very favorite and stops my heart. I am trying to figure out if I am mad at myself, sad at the loss of white, or should be indifferent? Anyway, let me know what I did wrong. This has not happened to me before so I was surprised to say the least and truly saddened for the loss of white on white. i have had this happen. i do believe it is temporary. two things may fix it. 2. relaunder them. sometimes that does it, too. I hope she updates us! New Stuff! info, thoughts, things. I am trying to test which way of communication is going to be the best for readers and for me… whether I continue to write here, on my website under “musings” or on my facebook page. For now, all three places are covered! The description of doing laundry in the 18th century is sobering. what I learned today while unpacking some linens. As I unpacked a box of linens that arrived recently, I wished I could talk out loud to everyone because it would be so much fun to share the experience! In this particular shipment, it was interesting to see rather ordinary items being lumped in and handled with the same care as some really exceptional things that a recent box contained. 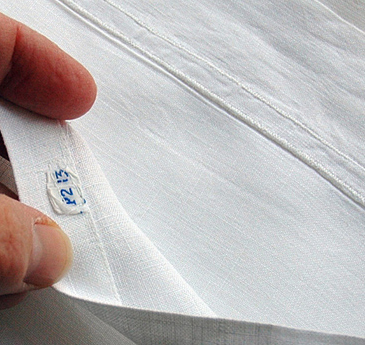 It was a good reminder that, to most people, a tablecloth is a tablecloth… is a tablecloth! It is only to slightly more educated and experienced eyes that things look remarkably different. I marveled to see items of varying quality being treated with the same deference. Simply unexciting contemporary sets of napkins were bundled and counted right alongside sets of splendid ones. Why is there a price difference in damask tablecloths on your website? This question arrived this morning and it is a good one. My reply is both practical as well as subjective. A customer inquired about three specific tablecloths. Tablecloths A and B are newer, ( 20th c. which is not necessarily a good thing but these are in superb condition), they are heavy (for damask), are off white in color (which is very rare) and are of a length which just pushes them into a very long size. (120″+) which also makes them rare. 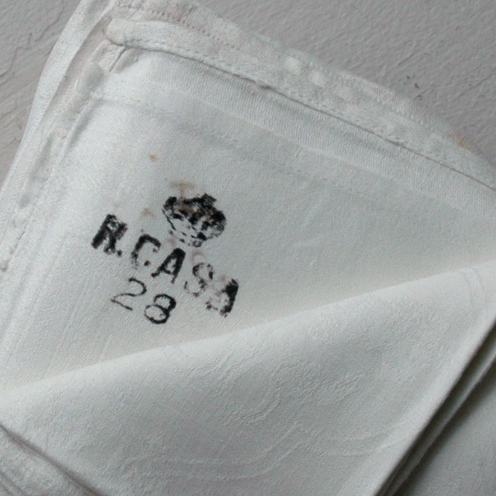 Tablecloth C, though spectacular and old (19th c.) has been used more, is worn (slightly), has imperfections in one corner and it has fringe, which modern people see as a detriment because they perceive it to be scary to handle. I, myself, adore fringe and I adore the quality and designs of old old damask… the A and B cloth designs are sleek and simple but I do love the old fashioned fringe and flowers. If they had figures or scenes in them, the prices would also jump up.